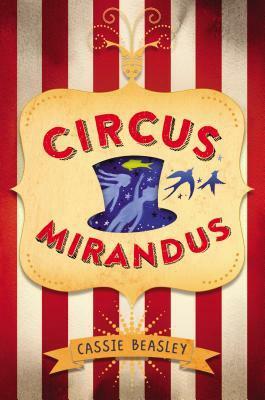 It is a rare event when I read a book and know it will be an award winner, but Circus Mirandus by debut author Cassie Beasley is going to win awards. The last book I was so certain of winning acclaim was The Graveyard Book by Neil Gaiman, and of course, it won the Newbery. In Circus Mirandus we meet Micah Tuttle. Micah’s grandfather, Ephraim Tuttle is very sick and Micah’s Great-Aunt Gertrudis has come to help care for them both. As her name suggests, Great-Aunt Gertrudis isn’t a very nice person, and Micah wants more than anything for his grandfather to get well so she will leave. For years, his grandfather has told Micah about Circus Mirandus, a magical circus that he visited as a youth. The Man Who Bends Light at this circus owes his grandfather a miracle. Micah has hope that somehow, the magic circus is real, and the Lightbender’s miracle can save his grandfather. This is an utterly charming tale, magical and yet with depth as Micah faces the death of his grandfather. Micah, Ephraim, and the Lightbender are complex, wonderful characters. The only negative comment I can make is that the book is too short. I hope that this author offers us a sequel, if only so I can see more of Chintzy, the cantankerous parrot. This book will appeal to younger readers who enjoyed Flora and Ulysses by Kate DiCamillo and The One and Only Ivan by Katherine Applegate.